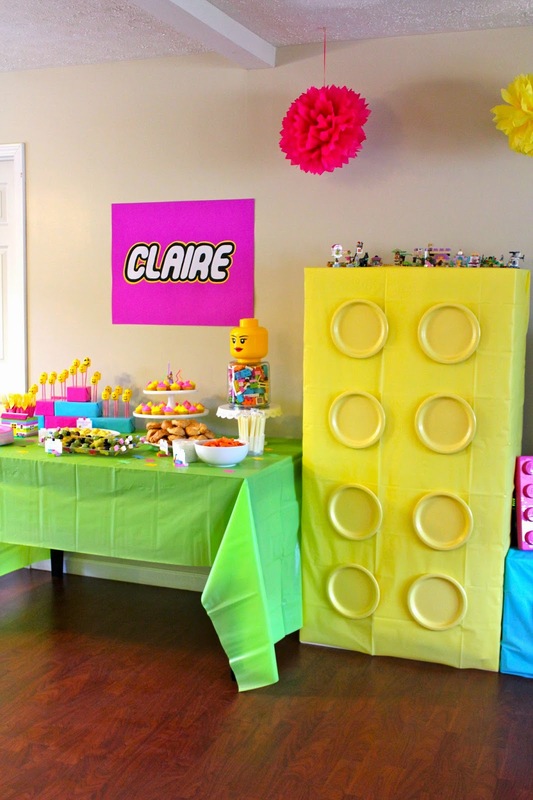 There are tons of Lego party ideas on Pinterest but there are actually very few girly Lego parties on there. 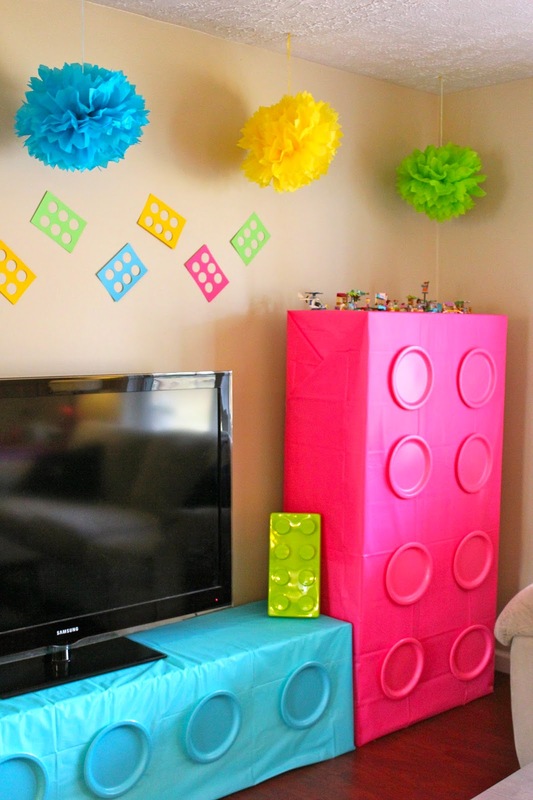 This party is a mix of a few of my own ideas and a few ideas from Pinterest that I just swapped the colors on to make them girly! My Mom and Sister are in town to help celebrate Claire's party and I put them to work! They were so helpful with making all of my crazy ideas come to life! I am so thankful that they were able to be here! 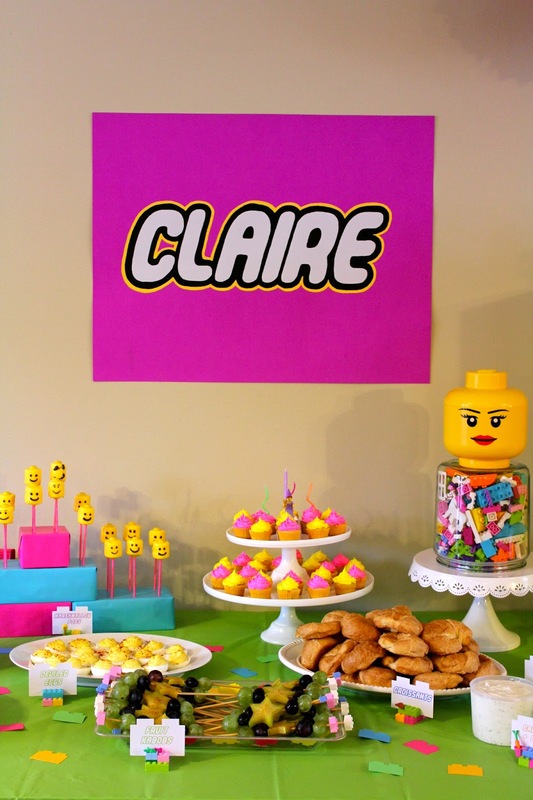 Birthday banner made with my Silhouette machine, the Lego Thick font, and foam stickers. The name poster is a poster board from Hobby Lobby. I cut white vinyl in Lego Thick font for the Claire and then I outlined her name in black paint and then in lots of coats of yellow paint. We have Ikea Expedit bookcases and I knew that they would make awesome giant bricks! We covered them in tablecloths and paper plates from Hobby Lobby. I love the statement that they make! The tissue poms are also from Hobby Lobby. They are so cheap to make from scratch but sometimes it is nice to just pay a little bit more for convenience! The green and pink large bricks are actually lids to Lego Juniors sets and Lego Duplo sets. On top of the giant Legos we displayed some of the girls small Lego sets. 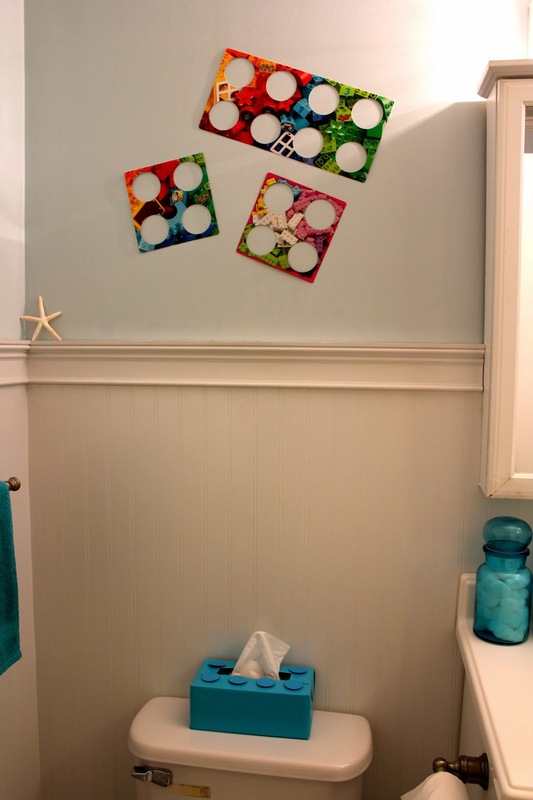 A tissue box covered in wrapping paper to look like a Lego and the cardboard packaging that surrounded those Lego Juniors and Lego Duplo sets taped to the wall! My Mom, Sister, and I all wore Lego earrings! 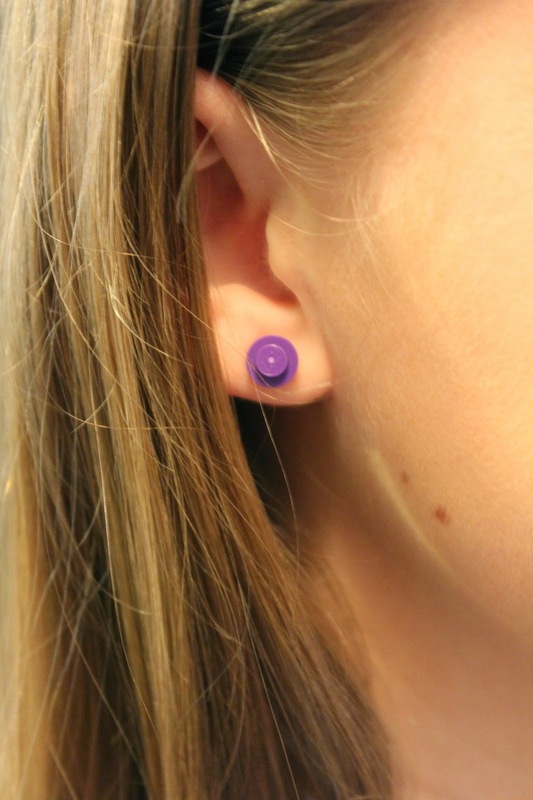 They are earring backs from Hobby Lobby that my Mom hot glued a little Lego piece to! I made a brick shape in my Silhouette Studio software and then added a 4 to it in the Lego Thick font. I cut it out of glitter heat transfer, ironed it to a Garanimals shirt from Walmart and voila custom Lego birthday shirt! 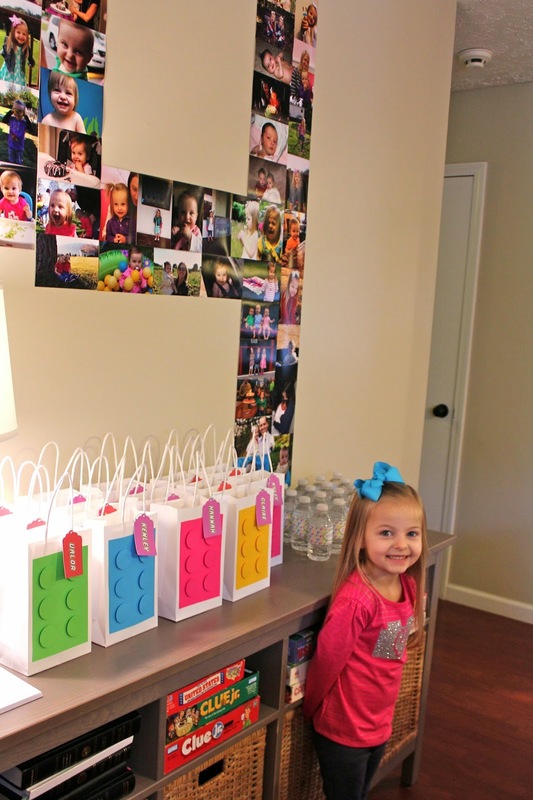 For Kenley's 5th Birthday party I started a tradition of taping photos of the birthday kid up in their age for the party and it has become one of my favorite traditions. 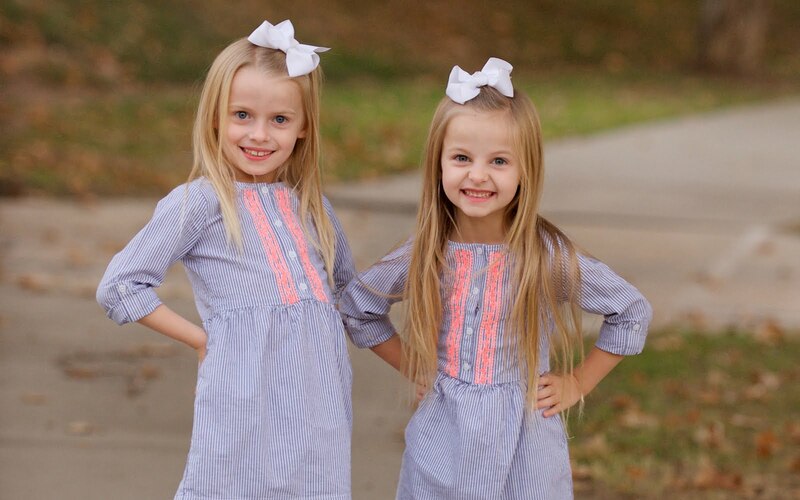 It is so sweet to look back and see how they have grown! And it forces me to print pictures which is always helpful! The night before the party I was loving all of the decorations except for the fact that our Christmas tree was still in the room.... It was driving me crazy because it clashed with all the party decor. I had taken all of our other Christmas decor down and hid it all in our bedroom... It is a little harder to hide a Christmas tree though. Since Claire's birthday is so close to Christmas, I am a bit of an extremist and want her birthday to be just her birthday, not her birthday and Christmas... To help the tree blend in, I hung a bunch of extra paper Lego's up on the tree, a Lego Juniors box lid became the tree topper, and a plastic table cloth became the tree skirt. 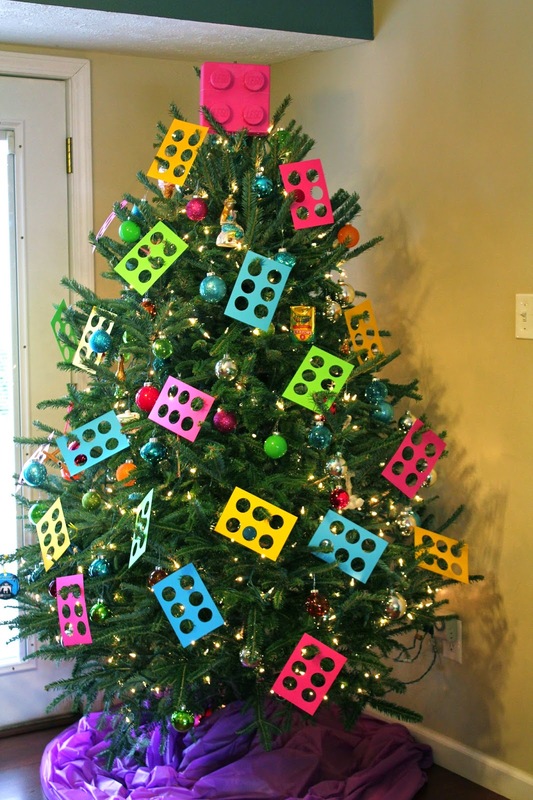 This helped to make our Christmas tree blend in a little bit better with the party decor! SO CUTE! I THINK THE TREE IS MY FAVORITE PART! :) SO CREATIVE. GOOD JOB. You always put together some of the most creative and amazing parties!